Vampire Beauties: Vampiress Review: "Matt Spade's Vanished"
Vampiress Review: "Matt Spade's Vanished"
The Gist: A young man who survived an outbreak of kids going missing when he was a kid goes back to his home town when it starts happening again. Clarification: Tommy was a kid in a small town in 1993. During that time kids were going missing, usually after hanging out at the local graveyard including his babysitter who went missing the same night she took him there and eventually his parents. Eventually he grows up and moves to Philadelphia and puts his past behind him but is loured back when a girl who prevented him from having the same fate during that time tracked him down to let him know it was happening again. Selling Point: Sometimes you watch a movie where you realize the person who made it just gets it. This is one of those films. Matt Spade set out to pretty much make a movie like Steven Kings "It" but with vampires. He pulls it off very well. The short film this was an extension of (which is reproduced for the first part of this film) was just as good. Vanished from Matt Spade on Vimeo. Female Vampire Factor: It's eventually revealed that there was a deal where the main vampire in the film would only feed on the towns undesirables. With the small size of the community and lack of criminals and homeless people the undesirables ended up being teenagers. Especially the promiscuous school girls who entertain older men in the town which there seems to be an abundance of. This results in most of the people being turned being 18 and 19 year old girls who then go around biting the young boys of the town who hang around the cemetery around dusk. This includes young Tommys hot babysitter who was turned after taking Tommy to the cemetery one day. We're eventually shown in a flashback after Tommys grown up that he was almost a victim as well but one of his young friends, a girl named Charity helped him destroy her. The film does go the twist ending route so that leaves it open for maybe a sequel as we find out all the vampires aren't dead with good old adult Charity being turned herself. I give this one a Vampire Beauty Rating of 5 out of 5. This is a horror/suspense that doesn't try to be anything other than that. Great storytelling, vampires are emotionless and evil with no gimmicks or A.D.D subplots diluting the film. Plenty of re-watchabilty, I definitely recommend this. 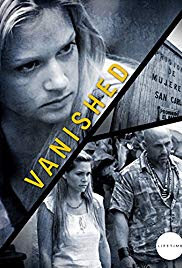 Vanished Trailer Official from Matt Spade on Vimeo.